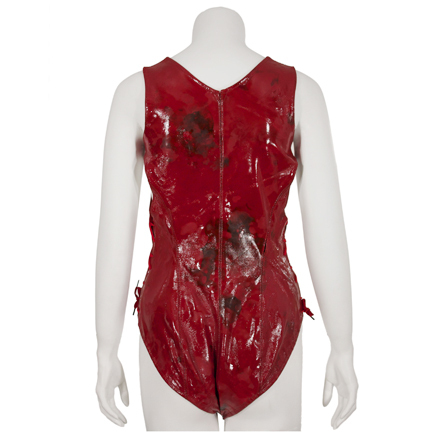 This red pleather body suit was worn by the character “Sheeva” portrayed by actress Marjean Holden in the 1997 motion picture “Mortal Kombat 2: Annihilation”, which was the sequel to the immensely popular 1995 feature “Mortal Kombat”. 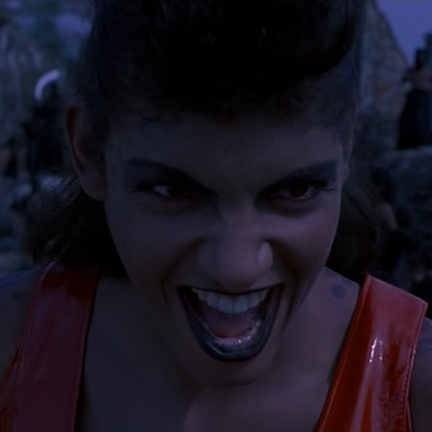 This was Sheeva’s signature style costume that was worn in multiple scenes throughout the film. The costume is constructed of red vinyl with lace up sides and button closures at the groin. There are visible black stains on the shoulders and verso of the costume. Ms. Holden wears this body suit throughout the film. 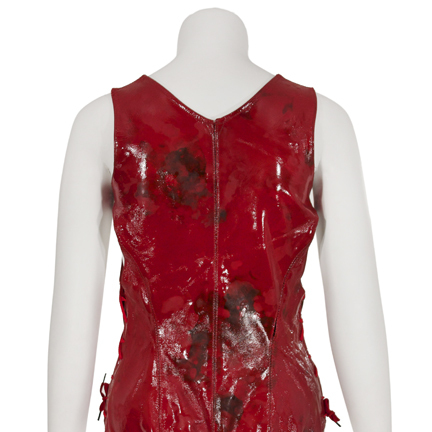 This outfit is heavily distressed with staining on the back that most likely occurred during the battle stunt sequence when Sheeva is crushed beneath a large hanging torch fixture released by “Liu Kang” (played by Robin Shou). The costume is missing the two straps go across the chest as seen in the alternate “clean” version seen earlier in the film, which may have been torn off or removed after its use in Sheeva’s final onscreen appearance. Accompanied by a letter of authenticity from the costume house. Presented by The Golden Closet, your premier source for screen used movie wardrobe, props, and collectible music entertainment memorabilia.